Powerboats - also referred to as motorboats or speedboats - are powered by motorized engines. Typically, they come with an internal combustion engine fixed inside, an outboard motor at the backside and the propeller and gearbox housed in one area. There are two types of powerboats, determined by engine placement. A powerboat that is inboard has the engine affixed in the hull with the drive shaft passing through it. The other kind is an outboard motorboat that has a detachable and portable motor with the drive shaft and propeller affixed to the stern. An inboard powerboat has two types of drive –the direct drive and the V-drive. The direct drive consists of the power plant affixed in the middle of the powerboat and the propeller is at the back. The V-drive has the power plant affixed to the boat’s backside, which involves a V at the back. Powerboats vary in dimensions and configurations according to their uses and applications. The category comprises small, single seater crafts on one end and massive, ultra luxurious superyachts on the other. The origin of the powerboat as we know it today, can be attributed to the latter part of the 19th century when the internal combustion engine was created. It is said that the first powerboat was designed and built by the Priestman Brothers in Hull, England. The popularity of these kinds of speedboats grew in the early 20th century with special clubs and magazines being created for boating related activities. Large companies started mass-producing motorboats and hence made them available to a larger section of the population. Today, one can see the utility in these boats in personal and commercial applications across the world. Powerboats or speedboats are largely used for recreational purposes. They are popular amongst those who like to cruise or travel in luxury over water. 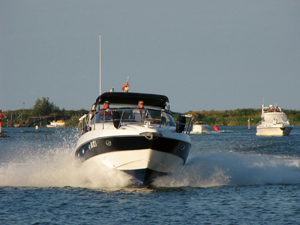 Additionally, powerboats are also employed in many watersports like skin diving, water skiing, fishing, racing, etc. Motorboats are also used in commercial activities like fishing and transportation. Ferries, tugs, barges carry small size cargo and passengers. Law enforcement authorities like harbor police and the coastguard also use motorboats to patrol waterbodies.